Hello! I'm exciting to be guest designing with The Color Throwdown Challenge for the month of February! Here are the gorgeous colors for this weeks challenge! I hope you'll play along with us! Everything I used on my card is from My Favorite Things and is listed and linked below in the inlinkz list. I stamped the dots in the background using the Distressed Patterns stamp set in Cement gray to ground my little cluster of elements here. This is a color scheme I would not have thought to choose on my own, but I absolutely love it! Who would have thought that gray leaves would be so pretty! 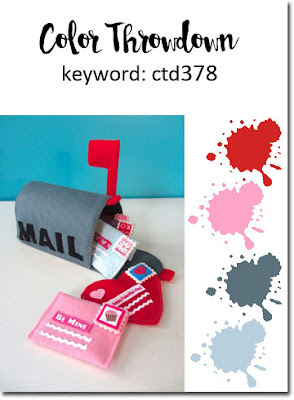 Stop by the Color Throwdown blog to play along with this lovely color scheme! And for more beautiful inspiration check out what all the other design team members have done! Congrats on the guest designing gig. I love your card. The greys and pinks look so good together. 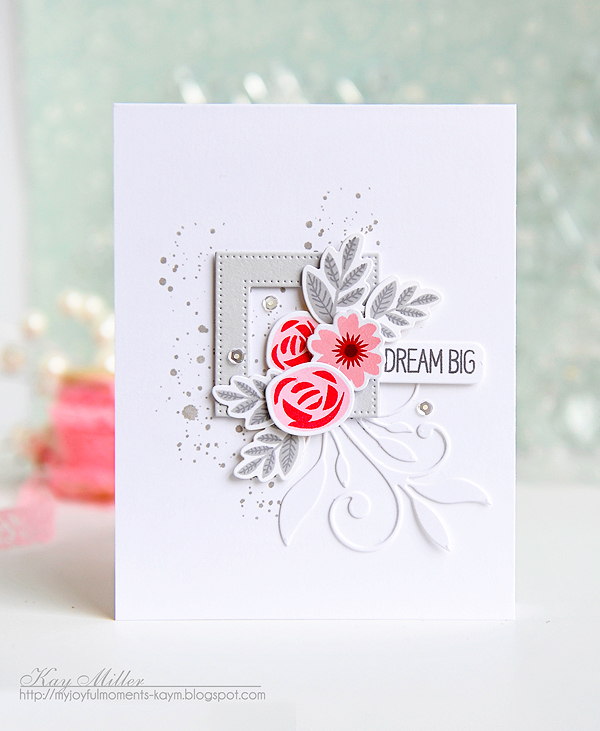 Such a gorgeous card, Kay! And you're right--who would have thought that gray leaves would look so stunning? I just adore this card! Very very pretty. makes me so happy you are crafting with us this month. your card is stunning! Love how you pieced it all together. This is so beautiful in every way ,Kay! The gray leaves looks amazing! I'm SO loving this gorgeous card! Ironically, I just ordered this stamp set yesterday. I've been a fan of yours for a long time and am thrilled to have you joining us as a guest designer this month! Oh, this is such a beautiful card, Kay! Stunning take on the challenge colors, and I love how you arranged your lovely flowers and flourish! Congrats on your Guest Designer spot...I will try to play along! Gorgeous!! Love your collage and wonderful use of the colors!! Your card for the CTD is really pretty!! I love the leaves and flowers and the way the flourishes are coming from the box. Great job!! 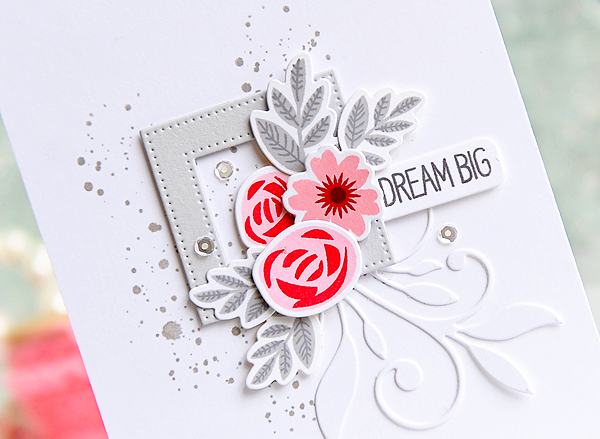 Kay another knockout card,the flourish and the pierced square. It all comes together beautifully! This is beautiful, love it to BITS and BITS!! So fabulous -- love the color against the gray! This is gorgeous, Kay! I love how you created your pretty framed bouquet. I'm so happy that you're guest designing with us this month! Love, love, love this Kay! Makes me want to buy the set and dies! This is just plain PRECIOUS! Gorgeous as usual, Kay!! I love how you used that frame behind your flowers! So excited to have you join us this month!! Congratulations on your GD role; your card is outstanding. Amazing what magic you create with a wee frame and a sweet cluster of flowers..